The Space Tree. This all started with a few Hallmark ornaments. 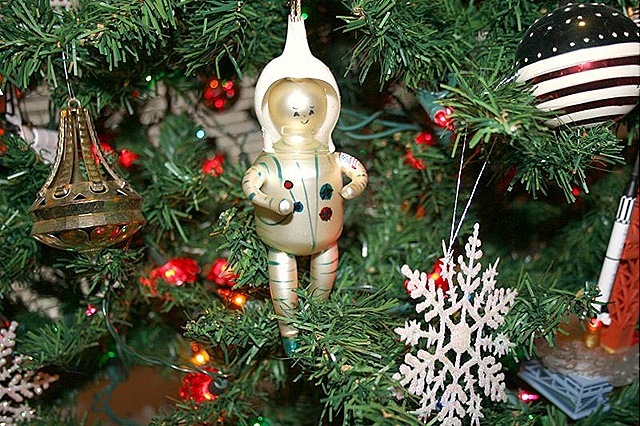 There was a series a few years back of ornaments from Hallmark made to commemorate important milestones in the exploration of Space and the history of NASA. Those of you hovering around that mid-century mark will remember some of these significant events and happenings. First lunar landing, Freedom 7 and Friendship 7. I started the collection for MrPeachez. He remembers orange Tang fondly. The discovery of two fabulous vintage italian ornaments at an estate sale in New Jersey expanded the collection to become a tree with ornaments related to "space". 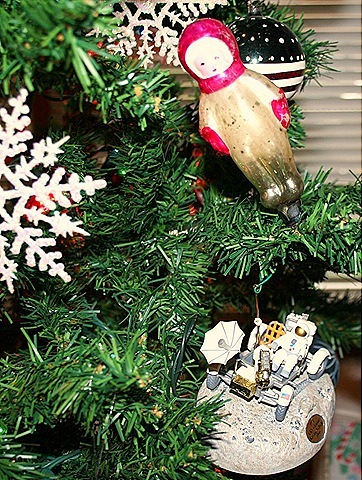 Couldn't be a space tree without a Russian Cosmonaut. This guy is one of my most prized vintage ornaments. The man in the moon. He is hanging right next to the dresden rocket boy. Tree No 6 is was found at a yard sale for $5. It used to be much shaggier, shag-a-delic actually. A couple of years ago I hauled it out to the back yard and gave it a haircut. I'm still finding bits of white tree tinsel in the dirt. This tree is filled with lots of special ornies. This tree sits in the most awesome stand that I found on eBay a few years back for peanuts. Score! Now it's time to move on to the feather trees. And the big day is just around the corner, yikes. Family is starting to arrive, it's party time. I love the white tree. They are both super awesome!! LOVE the space ones- I have been collecting this stuff for years and never seen those. Gorgeous! 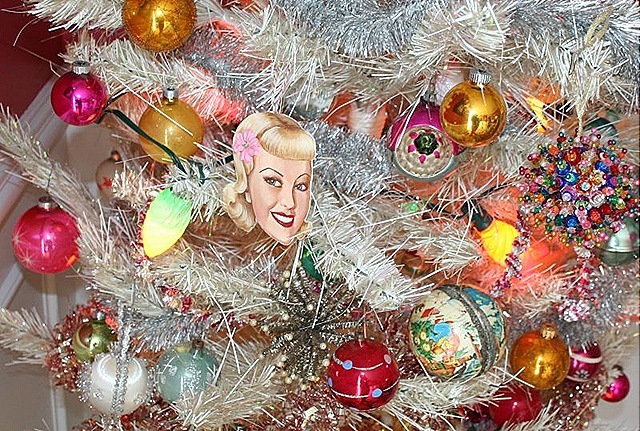 Love your shag-a-delic tree! And the tree stand. Your ornaments are great too! Oh my goodness, I’ve never seen space themed ornies before, but they’re so fun! What a great theme for a tree! 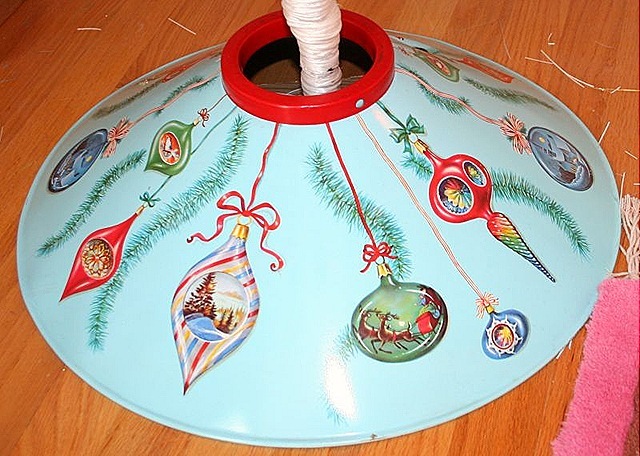 I am also in love with the tree “skirt” that you found for peanuts on ebay… that is the best! I agree with above posts, lovin’ that white tree. Merry Christmas Suzy! All of your trees are stunning, and the Space Tree is just spectacular and unique! Holy cow! That tree “skirt” is AWESOME! And I love the man in the moon ornie!! Great trees! I love them both but my favorite thing is that tree stand. I’ll say you scored! Good job. Oh, I just saw the very same stand at the antique mall half off and did NOT buy it … now that I see how great it is with your tree, I’m wondering if I should go back. The space tree is mind-boggling. Love the space tree. The man in the moon ornament is spectacular. Now whenever I see a space ornie I will think of you and your out of this world tree! I’d been on a slight blog break and finally stopped by to see what you’ve been up to. Quite a lot, obviously! 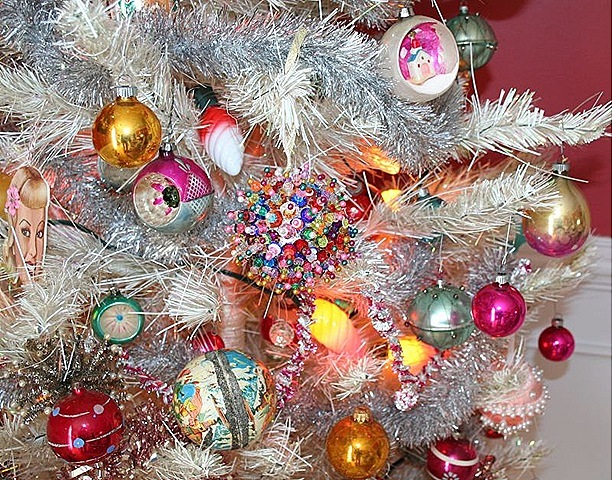 I don’t know which I love best… your peanut birds in a nest,the fabulous vintage tablecloths or your fun space tree. Merry Christmas. Wow! I remember your posts from last year…wondering how in the world you do it all! LOVE the trees! and that STAND! It took my breath away! Merry Christmas! That Tree Stand is AWESOME! I’ve never seen anything like it! What a score! I just love coming to your blog, but especially at this time of year. I am so tree happy! i love the stand, and all the ornies. Have a wonderful time Suzy – you know how to make a home VERY festive! Just stopping by to say Happy Holidays! I love all your trees, they’re so festive! Hope you have a great holiday! Suzy your trees are beautiful!! 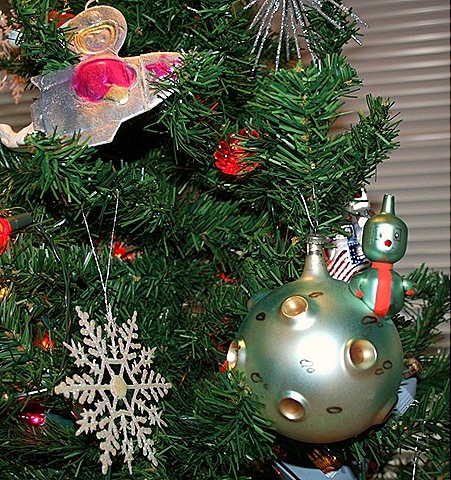 That Space Tree, wowzers, what amazing ornaments! I’ve never seen anything like them in my life! Your blog is so winter wonderlandy –I LOVE it! and where exactly did you find that amazing tree base on your white feather tree? Love all your trees-they’re all really unique! This is so very well done. Actually the tree is fascinating, the space theme et al. Just had a moment to read through your last couple of posts. Great things:) The mushroom tree is wonderful… Over the past year, I’ve been really getting into mushrooms – The Forgotten Fungi! hehe… Anyways, the sequin “mod” tree with hot pinks and oranges is also fabulous. I linked over from Magpie Ethel. I’m looking at your trees and my heart is pounding…fab! And your photos are just beautiful.